Author: Coffi Sambiéni. Series edited by: Gudrun Miehe, Brigitte Reineke, Manfred von Roncador. 18 pp. Roman, 316 pp. 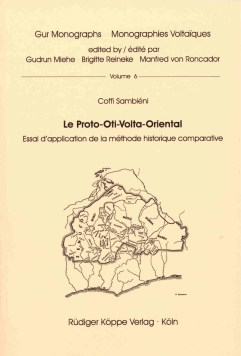 The Eastern Oti-Volta group is one of the subfamilies of the Gur languages and so belongs to the large Niger-Congo branch. The group is comprised of the four languages Byali, Ditammari, Nateni and Waama. The author of this book works out the genealogical relationship between the four languages with comparative methods, and describes them on the basis of recent language data. This requires a bipartition of the paper. The first part includes – after a general introduction – a synchron description of the four languages, containing their phonology (chapter 2), nominal classes (chapter 3), and verbal systems (chapter 4 and 5). The second part deals with the linguistic-historical reconstructions. Two chapters consist of the derivation of the proto-phonemes, the next two chapters describe the reconstructions of the nominal and verbal systems. Extensive lexical reconstructions can also be found by the reader in this chapter. The results are compared and discussed by the author with earlier finding of Manessy 1975. This work is closed with a conclusion, an exhaustive bibliography, and an appendix including historical-comparative glossaries.